Berlin based talent Black Loops arrives on Madhouse Records to deliver his four-track ‘JAH Love’ EP this April, featuring two cuts alongside Nikoss. With releases on Toy Tonics, Freerange, Pets Recordings and Neovinyl to name just a few, Riccardo Paffetti aka Black Loops has built a stellar reputation as one of house music's most consistent and impressive names since making his production debut back in 2013. A skilful hand both within the studio and behind the decks, the Italian's slick blend of deep and soulful house music takes cues and inspiration from funk, disco and beyond, with his latest batch of productions coming in the form of his ‘JAH Love’ EP on Madhouse Records this April, featuring New Zealand producer and musician Nikoss. 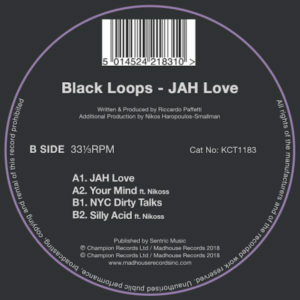 Title track ‘JAH Love’ opens the package through a smooth blend of skipping percussion, infectious vocal samples and funk heavy instrumentation, before ‘Your Mind’ introduces the first of two productions alongside Nikoss as rich piano melodies and acid-tinged bass patterns merge effortlessly throughout the track’s six-and- a-half-minute duration. On the flip, ‘NYC Dirty Talks’ takes a trip across the Atlantic as resonant pads and slick drum licks combine to reveal a production that would find itself perfectly at home within any Kerri Chandler set, before rounding out proceedings with the bubbling 303 driven ‘Silly Acid’ once again in partnership with Nikoss, guided by bright keys, soft chords and vibrant low-end tones.